Our beautiful range of uPVC porches will add character to your home, creating an inviting entrance that will delight your neighbours and guests. Our complete range of double glazed porches are designed to meet your tastes, so you will get a tailored porch that has a design unique to you. 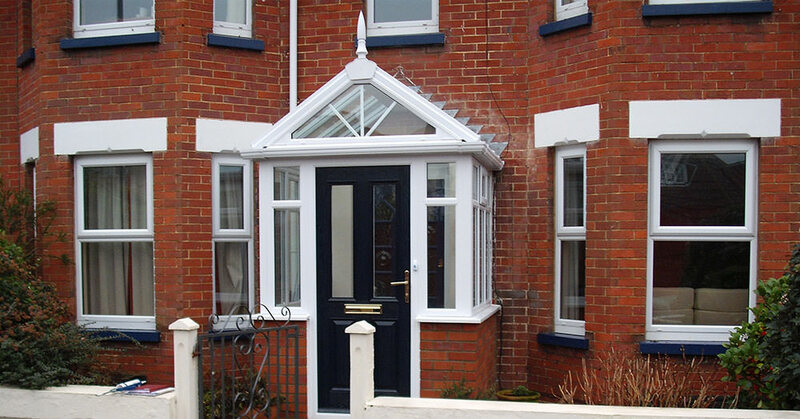 Our quality range of double glazed porches will add curb appeal to your Margate, Kent, Canterbury or Herne Bay home. Your guests and neighbours will love your stylish and tasteful new uPVC porch. These practical and versatile home improvements truly add value while saving you money on your energy costs. Coming home to a welcoming and stylish entrance to your home in Margate, Kent, Canterbury, Herne Bay, Folkestone, Ashford, Dover and Deal can really brighten your day. Your new porch can complement your existing windows and doors, or can be in contrast to them. You have the choice of a variety of colours and finishes, including woodgrain effects that look so much like traditional timber frames it is hard to tell the difference. We are also able to provide you with a selection of glazing options, giving you the opportunity to truly tailor your porch to your tastes. Our range of porches are designed specifically to suit the space that you have available and the styles you prefer. They are designed to tie in with the style of your home, so that they blend, giving you a beautiful finish. They are completely individual to you and your tastes. Our design team will listen to your ideas and create a bespoke porch that completely achieves the look you imagine. Our uPVC porches are as high quality as the rest of our double glazing. When creating your porch, only the very best materials and latest technological advances are used. This will help to provide you with superior energy efficiency. Your home will be warm and cosy, so you could save on energy bills. Heat loss will be minimised and there will be absolutely no draughts when you choose one of our impressive double glazed porches. Using the most cutting edge manufacturing techniques and superb design features, our porches will protect you against the harshest of Britain’s weather conditions. They are fabricated to the very highest standards, and this means that your home will be draught free and dry with one of our exceptional porches. As with our uPVC doors our double glazed porches come with highly secure multipoint locking systems as standard. We want you to be confident that your home is protected against potential intruders. It has been rigorously tested against prolonged physical attacks and the results were exceptional. You are safe and secure in your home with a uPVC porch from Omega. We have a friendly and expert team available to take your call and discuss your uPVC porch requirements with you. They can guide you through the extensive options available and assist you in finding the right combination for you and your home. You can even get a free quote that is based on your exact specifications. There’s no obligation attached, it is simply our way of offering an honest home improvement service.